After a few years of being somewhat of a forgotten fashion accessory, sunglasses have made a huge comeback. And we’re not talking about those classy frames with a small logo at the temple, we’re talking big, loud and crazy. Although they still protect your eyes from the potentially harmful rays of summer sun, these new shades are all about making a fashion statement. Here are the top five sunglasses trends for 2013. What’s really new and exciting this season are the lavishly decorated frames, most notably seen at Prada. Erdem, House of Holland, Roberto Cavalli and Dolce & Gabbana also included variations on this outrageous theme in their collections. Flowers, flourishes, colors, animals — nothing is too much here. In fact, this trend is all about being over the top. The main muse, perhaps, is street style icon Anna Dello Russo, who included a pair of shades decked out with gilded alligators in her design collaboration with H&M. This is not a trend for the shy, conservative or less-is-more kind of girl — but dare to give decorated shades a try and we promise you’ll get lots of compliments. In a throwback to the 80s, mirrored glasses and colored frames have both made a big comeback. Although it may seem like they belong in an after ski lodge filled with people wearing neon, mirrored glasses can look surprisingly sophisticated paired with a minimal — perhaps all white or all black — outfit. 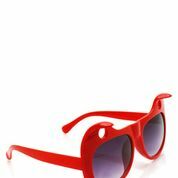 Marni, Wildfox Sun, Marc by Marc Jacobs and Ray Ban all offer great options. The added benefit is that they enable you to walk down the street somewhat incognito, without revealing what you’re looking at. The downside is that people might make a mirror face every time they look at you. Colored glass, seen at Gucci, and colored frames, like at Marc Jacobs, are another, more discrete way, to channel this trend. Cat eye glasses started appearing on the runways a few seasons ago and are still going strong. This classic 50s shape instantly inspires visions of a more glamorous time. 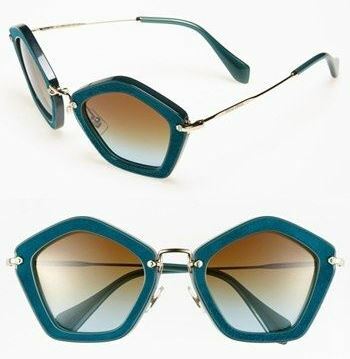 Depending on how you style them, cat eye shades can look either fun and quirky or elegant and sophisticated. Great options can be found at Elizabeth & James, Jason Wu, Anna Sui and, let’s not forget, well-stocked vintage shops. The extreme version of this trend is glasses that actually incorporate cat ears as well (not unlike this winter’s popular cat ear beanies). Perhaps too much for most, but good if you’re trying to get attention from street style photographers. Always in style, classic shapes are a sure bet when it comes to sunglasses. If you invest in a good pair, you want them to last for a very long time. The key to not losing them, a dapper friend once told me, is to follow a simple rule — “off the face and into the case.” Classic pilot frames are always a good choice, so opt for a style with golden frames and lenses for a warm, sun-kissed look. Stetson sunglasses are a great option for this look with a double bar bridge, diagonal stripes, Zyl temple tips and snap-in nose pads. When Diane von Furstenberg decided to partner with Google to incorporate the new Google glasses into her Spring 2013 runway presentation, it signaled a moment of established fashion houses embracing technology in a new way. Think what you will of the Google glasses, which may lack a bit in the style department, but the futuristic glasses trend seems to be here to stay. Interesting versions, some inspired by safety glasses, were seen at Michael Kors, Zero + Maria Cornejo, Rick Owens, Chanel and Prabal Gurung. Geometric shapes — round, square, angular, etc. — were seen at Chanel, Wildfox Sun, Miu Miu, Linda Farrow, Matthew Williamson, Lanvin and more. Angular shades make a fresh, edgy statement, while round ones bring to mind 60s and 70s vibes a ‘la John Lennon and the love generation. Whichever style you choose, one thing to remember is that they should be BIG. After you have your eyewear figured out, we here at the Fashion Blogger would suggest you figure out which headwear you should wear. The obvious first place to look for a new hat would be Stetson. You can learn more about them on the Apparel Search clothing industry directory. 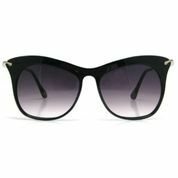 This entry was posted in Eyewear, Fashion, Fashion Accessories, Fashion Blog and tagged eyewear, stetson, Stetson Sunglasses, sunglasses, top 5, top five, trends. Bookmark the permalink.